Reward your health and earn stars with every purchase. Earn more stars to redeem more rewards. Any coffee, tea, and signature brew purchase is worth 1 Star. Any salad, sandwich, smoody, 12oz and 16oz juice purchase is worth 2 Stars. Redeem 10 stars for a coffee, tea or signature brew OR redeem 20 stars for any menu item*. *Smood Market & Hot Virgin Cacao excluded from redemption. No need to sign-up or download app. Ask a Dr Smood team member to see how close you are to that next superfood fuel on us! 1 star = purchase of any (1) coffee, tea or signature brew. 2 stars = purchase of any (1) salad, sandwich, smoody, 12oz or 16oz cold-pressed juice. Purchase any salad, sandwich, smoody, 12oz or 16oz cold-pressed juice worth 2 stars. What can I redeem my stars for? You can redeem 10 stars for any coffee, tea or signature brew. You can redeem 20 stars for any product in-store except for items from Smood Market or the Hot Virgin Cacao. How do I redeem my stars? 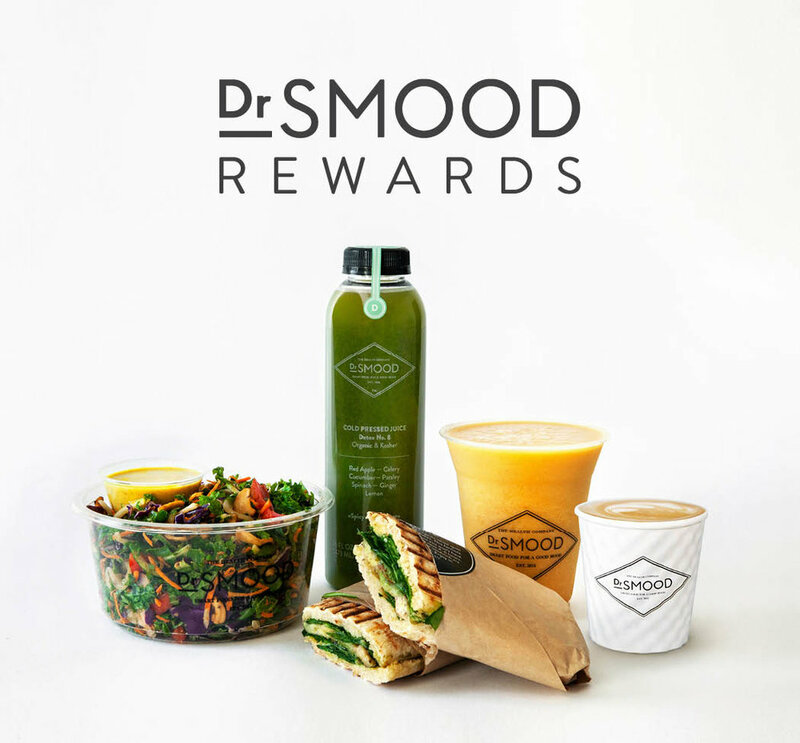 When paying for your order, give your phone number or name to a Dr Smood staff member. He/she will look you up in the system in order to redeem your stars. What if I have 30 or more stars and want to redeem for rewards? You can redeem stars in 10’s and 20’s, as you prefer. 20 stars + 10 stars: Customer may redeem any menu item AND any coffee, tea or signature brew. 10 stars + 10 stars + 10 stars: Customer may redeem any (3) coffee, tea or signature brew. What if I have 30 or odd number of stars and only want to partially redeem my stars? You can redeem in 10’s and 20’s, as you prefer. Is there a limit to how many rewards I can have at any given time? There is no limit, you can earn as much as you want. How do I see how many stars I currently have? You will be updated on your next purchase; a screen shows up at the end of the purchase process. Can I see my past purchases in the Rewards Program? No. Past purchases are not available for viewing in the Rewards Program. What happens after I redeem my stars? If there are still stars remaining after a purchase, you can still continue earning stars until your next reward redemption. If all stars are redeemed, your star balance will revert to zero and you can begin again earning your way to your next reward. I’ve made purchases at Dr Smood off multiple, separate credit and or debit cards. Can I combine my stars from each card to redeem for rewards? Yes, you can combine your stars from each card to redeem for rewards. Talk to a Dr Smood staff member to help merge your cards into one account. Items must be purchased on the same credit or debit card to count towards rewards. I didn’t like my item purchased using rewards. Can I return it and get my stars back? No, reward items are non-returnable or non-refundable. Does the purchase of the Hot Virgin Cacao count towards earning stars? Yes, it counts for a star. The Hot Virgin Cacao is a signature brew. What if my credit or debit card is lost or stolen/I get a new credit or debit card. Will I maintain my stars or start over again? Let our manager know and we’ll update your credit or debit card information on Square; you will maintain your stars.